This Large Flag and Military Medals Display Case Cabinet is available in either cherry or oak, and has a glass front with turn-button closures on the back of both the display and the flag case compartments. A precut mat is included to fit a standard certificate. 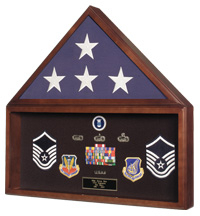 Simply remove the precut mat to configure as a shadow box for awards, medals, photos and other valued mementos.